I just had an out of town visitor comment on how much better he likes the Dallas skyline. He was doing the dreaded Houston comparison because their skyline is so dark yet the same size as ours. Anyways I await the LED pinstripes return. Video from a newscast in the early 2000s, showing the Drever illuminated. cowboyeagle05 wrote: I just had an out of town visitor comment on how much better he likes the Dallas skyline. He was doing the dreaded Houston comparison because their skyline is so dark yet the same size as ours. Anyways I await the LED pinstripes return. Are they the same size?... Houston's taller but not as long as Dallas' skyline. LED is great and all, but projection is the future. He didn't know the exact just sees them as similarly sized and I would agree considering the point is Houston he felt was missing out on some potential energy and visual interest from a lack of lighting. Keep mind no one is saying every LED contribution to the skyline is an Oscar-winning performance but overall some people like the energy projected by the new lighting to our skyline. tamtagon wrote: LED is great and all, but projection is the future. The Conv Ctr hotel is quaint with the light show capabilities it has now, but imagine projections for special events and whatever.... I would LOVE to see what could be done with Fountain Place. This building too. I think this kinda stuff is already popular in Europe, maybe. Oh ok, I know what you mean. Dallas could use a lil more Shanghai-esque lighting. I like it! Oh, that’s very cool. Would this be permanent or just for special occasions? So this is actually across the street from 1401 Elm and when they say it 'connects' they are referring to that skybridge? This is the first I'm hearing of this, but awesome if this and 1401 Elm are both completed. This is exactly what more DART stations should look like. Looks Great! I am excited to see some new renderings. Interesting that they have Macy's as the tenant, usually it is a fake tenant name until someone commits to a contract. If I understand this rendering correctly, this add-on developement is the DART headquarters building with structural steel added outside of and through the existing building to support two six floor towers on top. There have been rumors for several years that DART wants to move to a smaller building, but I have not heard anything lately. Is a DART move back on the front burner? Wow, a new Macy's downtown? And a mall? That would be amazing. I'd rather see a Dillard's or Nordstrom or even Target but I'll take an urban Macy's! But.... pretty sure these are just pipe dream concepts renderings. This is the now dead project by former owners of the Drever. They wanted to build the Downtown shopping mall and the space of 1401 Elm was not enough to make a big enough draw so they proposed to buy DARTs HQ and redevelop it as a bigger retail project. It never made it off the drawing boards though. The DART board supposedly considered the offer but I am not sure why it fizzled. DART still wants to move but they haven't really made any serious plans. Developers are chomping at the bit to get the DART HQ last I heard. Not for retail but more residential. cowboyeagle05 wrote: This is the now dead project by former owners of the Drever. They wanted to build the Downtown shopping mall and the space of 1401 Elm was not enough to make a big enough draw so they proposed to buy DARTs HQ and redevelop it as a bigger retail project. It never made it off the drawing boards though. The DART board supposedly considered the offer but I am not sure why it fizzled. DART still wants to move but they haven't really made any serious plans. Developers are chomping at the bit to get the DART HQ last I heard. Not for retail but more residential. DART HQ should just move to Mockingbird Station. Maybe the New Orleans developer who worked on The Mayflower can turn 1401 Pacific into the next downtown residential address. You mean The Drever already under construction aka 1401 Elm to be retail, residential and a hotel. 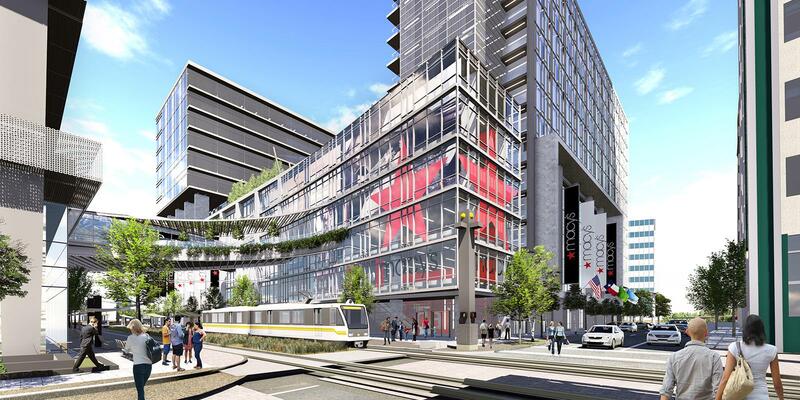 No, I mean 1401 Pacific (DART HQ) should become residential + retail after The Drever is done. Cleaned marble is being put back on ! Looks like new ! ^^^I thought it would take a year for them to get the marble back. dallaz wrote: ^^^I thought it would take a year for them to get the marble back. That's what I thought too but maybe it was just a year to completion. Who wrote the story? It wasn't a story, just a post from The Drever Instagram account. That's great! The building has been such an eyesore with its marble removed, so I really happen its being re-added. I walked passed The Drever on Thursday and assumed they were still talking down the marble. The exact photo they have posted on their Instagram account, is what I saw taking place Thursday morning. The building looks like a complete eyesore without the marble. I’m glad to see it going back up. Besides, Macy's has closed more stores lately than they have opened...including downtown stores. It was never about Macy’s they were a placeholder just to show the space they were allocating to one retailer. I think we all would prefer a Target over a Macy’s downtown anyway. They also were proposing a bowling alley or movie theater I believe. Alll things I think they pitched to possible tenants. Like I’ve said before about the Drever if we can just get them far enough along to get the marble job finished we will be miles further along in getting this giant anchor of a project closer to a finish line. Even if this developer fails to finish this final proposal. Get the marble back up making the building shine so much better investors will be more agreeable about dumping more money at another redeveloper. Redoing a buildings exterior is a huge waste to a bank because they are costs they don’t see a return on. Someone has to do it with buildings like this but no bank wants to make that bet and 99% of them are willing to walk away from making that bet. They were testing LED's on this one last night at the top of the building at the ends of the white pin-stripes. They were shining up into the sky and moving around like spot lights. Hope that description makes sense. Dmkflyer wrote: They were testing LED's on this one last night at the top of the building at the ends of the white pin-stripes. They were shining up into the sky and moving around like spot lights. I found the picture that you’re talking about online. I was hoping there would be some news on this. There's been absolutely zero visible progress besides them testing the lights so far in 2018. Broken windows remain covered in plywood. Marble remains off the building. I have no idea how they'll meet the pushed back deadline at this pace. Is it safe to assume they can't point those lights like that permanently into the sky correct? I wonder if they don't plan to light the pinstripes the way they used to be lit but instead use lights at the top and bottom to wash the pinstripes in light. Kinda how AT&T lit its monolithic protrusions recently. I imagine a brand new LED system running down every pinstripe is a huge cost they may have to avoid not to mention could be so bright to disturb downtown residences. Keep in mind when the original was lit you could see them for miles and there was no residential downtown. cowboyeagle05 wrote: Is it safe to assume they can't point those lights like that permanently into the sky correct? I wonder if they don't plan to light the pinstripes the way they used to be lit but instead use lights at the top and bottom to wash the pinstripes in light. Kinda how AT&T lit its monolithic protrusions recently. I imagine a brand new LED system running down every pinstripe is a huge cost they may have to avoid not to mention could be so bright to disturb downtown residences. Keep in mind when the original was lit you could see them for miles and there was no residential downtown. They could always turn down the intensity of the lights. I was driving past downtown very early in the morning around 3 am. I noticed that the initinsty of the Whitacre Tower’s lights were turned down. Many of the buildings downtown turn off their lights during that time and turn them back on before the sun comes up. That’s generally when people get up for work, school, etc. I’m sure the same can be done for The Drever. The lights look pretty great on top.. although I do wish they would light up the stripes like before..
Have there been any progress with this project? dallaz wrote: Have there been any progress with this project? Tile is being removed still. Wow, I thought they’d be done with that by now. Do you mean that you have seen tile being removed recently or that there is old tile still up? The latter is true (the entire north face of the podium above the DART station is still tiled), but I have not seen any evidence of actual work on this building in several months. I guess all we have to hold on to hope at the moment is that they are playing with lighting the building. I really hope this keeps going it is so important to bring this part of downtown all together. From the outside it looks slow but no idea what has been done in the building, it does look like a lot of patio work has been done on that large outdoor Amenity deck. There was some discussion of this project on the downtown residents council facebook page. It is very clear there is zero work being done inside 1401 Elm St. besides sporadic updates to the Drever facebook page, and it has been that way for several months. Their priorities should be much different than exploring lights to point in the sky or redoing the outside marble. The Drever organization is the kid who has a huge test the next day but stays up all night playing video games. It is very frustrating to us that live downtown that they have a huge swath of sidewalk closed off for no reason, and we are staring at a building that is uglier than it was when they began thanks to them removing marble from the building under the guise that the marble would be refurbished and quickly replaced. I'm afraid that my original hunch that removing marble is nothing more than a play to improve their bargaining position with the city of Dallas may be true. It's much easier for them to get the city to agree to push back deadlines time and time again when the consequence for pulling funding from Drever is us being stuck with a far uglier building for an indeterminate amount of time. I know there wasn't much interest from other developers at the time of the sale. But it's clear it's not happening with this developer. Last edited by trueicon on 12 May 2018 20:16, edited 1 time in total. I bet a FOIA request on all correspondence between the City (Economic Development) and Drever would be enlightening. Could this be one of those redevelopment projects that goes so sideways they end up razing the building? I knew those guys were bush league when they ginned up all that publicity after the bought the property and the named the building after themselves. I pray to Buddha they do not end up demolishing this building. That would be absolutely horrible. This poor building is cursed. joshua.dodd wrote: I pray to Buddha they do not end up demolishing this building. That would be absolutely horrible. This poor building is cursed. I think the chances of this building being demolished are slim to none. If Elm Place were destroyed, it would hold the record for tallest building ever demolished in the entire world (outside of 9/11). I can't even imagine what it would take to take down a building like this. Seems unlikely. With most if not all of the demo & abatement completed, the building could go on the market tomorrow and it would be a steal for the next buyer. All of the hard work has likely been done. lakewoodhobo wrote: With most if not all of the demo & abatement completed, the building could go on the market tomorrow and it would be a steal for the next buyer. All of the hard work has likely been done. I wouldn't be surprised if that was the plan all along. The next owner would also inherit the deal with Thompson hotel (and possibly others we don't know about) and numerous tax/TIF incentives from the city. For what feels like the third time this project could be simply moved down the road to the next wide-eyed developer looking to make a name for themselves. The marble still has to be returned and reinstalled and that's a costly expense that still doesn't have a calculable return on investment. That's if it isn't held for "ransom" from the company doing the laser cutting if they don't get the last of their money. Isn’t that exactly what happened with LTV Tower? The people doing the abatement were all vapor ware, but they sold the building to a developer who could finish the project. It’s a creepy way to do business but these guys seem to serve a valid function in process of redeveloping historic buildings. The difference is that LTV Tower and the Statler were planned to do that. The developer who cleaned about both of those properties was known for cleaning out buildings and flipping them to a finishing developer. Here the Drever people intended to actually finish the job but continue to fail to do so. Can someone just flip the building to Headington? I am sure he can finish the job and he won't have much history to ruin here unless he tears down the whole building. On the fantasy side how about the Avengers move in like when Tony Starck modified the Pan Am building into Starck Tower then became Avengers HQ. The last several times I've been by there on the bus, I've seen no construction activity in or out of the access gates; the one facing Elm is chained and locked. And the times getting on the train at Akard, no construction sounds. None. There are some lights on, on one of the lower floors, the bare incandescent bulb kind. Since I haven't heard of Drever or its history, I don't know if they've ever had give-ups or $$$-flow problems in the past.